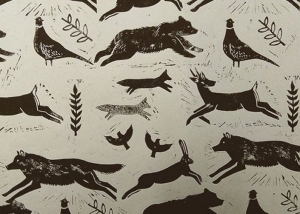 Sophie Berger will be continuing her popular Lino Printing workshops from her lovely studio during 2018. A morning workshop from 10am to 1pm , for all levels from beginners upwards, and all are welcome. Guidance at every step to create your own greeting cards and limited edition prints. Once your design is created on the lino, it will be cut and carved to create bold and experimental designs. Using specialist carving tools, a combination of broad strokes and detailed fine cuts, the lino block is moulded to create a relief print of your desired image. Paint is then applied with a roller and using a relief press or burnishing tool, you are able to create multiple prints, which can either be abstract, used as a repeated pattern or that of a figurative design. Your lino design can be taken home so you can print cards for all occasions! Groups are welcomed and if there are enough of you, email Sophie to book a private workshop. All materials will be provided, just bring along an apron. The workshops cost £35 pp each, which includes materials and refreshments. Make your own Christmas wrapping paper, gift tags and other great presents!